ON THIS PAGE: You will find some basic information about this disease and the parts of the body it may affect. This is the first page of Cancer.Net’s Guide to Esophageal Cancer. Use the menu to see other pages. Think of that menu as a roadmap for this complete guide. The esophagus is a 10-inch long, hollow, muscular tube that connects the throat to the stomach. It is part of a person’s gastrointestinal (GI) tract. When a person swallows, the walls of the esophagus squeeze together to push food down into the stomach. Cancer begins when healthy cells change and grow out of control, forming a mass called a tumor. A tumor can be cancerous or benign. A cancerous tumor is malignant, meaning it can grow and spread to other parts of the body. A benign tumor means the tumor can grow but will not spread. Esophageal cancer, also called esophagus cancer, begins in the cells that line the esophagus. Specifically, cancer of the esophagus begins in the inner layer of the esophageal wall and grows outward. If it spreads through the esophageal wall, it can travel to lymph nodes, which are the tiny, bean-shaped organs that help fight infection, as well as the blood vessels in the chest and other nearby organs. Esophageal cancer can also spread to the lungs, liver, stomach, and other parts of the body. Squamous cell carcinoma. This type of esophageal cancer starts in squamous cells that line the esophagus. It usually develops in the upper and middle part of the esophagus. Adenocarcinoma. This type begins in the glandular tissue in the lower part of the esophagus where the esophagus and the stomach come together. Treatment is similar for both of these types of esophageal cancer. Other, very rare tumors of the esophagus, which make up less than 1% of esophageal cancers, include small cell neuroendocrine cancers, lymphomas, and sarcoma. ASCO Answers Fact Sheet: Read a 1-page fact sheet that offers an introduction to esophageal cancer. This fact sheet is available as a PDF, so it is easy to print out. The next section in this guide is Statistics. It helps explain the number of people who are diagnosed with esophageal cancer and general survival rates. Use the menu to choose a different section to read in this guide. 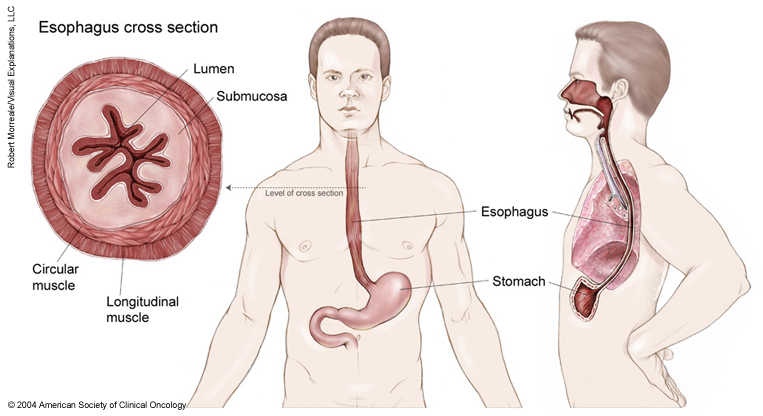 ON THIS PAGE: You will find a drawing of the main body parts affected by esophageal cancer. Use the menu to see other pages. This illustration shows the esophagus, a long, hollow, muscular tube that connects the throat to the stomach. A cross section of the esophagus shows two layers of muscle: the longitudinal muscle on the outside and the circular muscle on the inside, which surrounds the submucosa. The hollow interior of the esophagus is the lumen. Copyright 2004 American Society of Clinical Oncology. Robert Morreale/Visual Explanations, LLC. The next section in this guide is Risk Factors. It explains the factors that may increase the chance of developing esophageal cancer. Use the menu to choose a different section to read in this guide. ON THIS PAGE: You will find out more about the factors that increase the chance of developing esophageal cancer. Use the menu to see other pages. Age. People between the ages of 45 and 70 have the highest risk of esophageal cancer. Gender. Men are 3 to 4 times more likely than women to develop esophageal cancer. Race. Black people are twice as likely as white people to develop the squamous cell type of esophageal cancer. Tobacco. Using any form of tobacco, such as cigarettes, cigars, pipes, chewing tobacco, and snuff raises the risk of esophageal cancer, especially squamous cell carcinoma. Alcohol. Heavy drinking over a long period of time increases the risk of squamous cell carcinoma of the esophagus, especially when combined with tobacco use. Barrett's esophagus. This condition can develop in some people who have chronic gastroesophageal reflux disease (GERD) or inflammation of the esophagus called esophagitis, even when a person does not have symptoms of chronic heartburn. Damage to the lining of the esophagus causes the squamous cells in the lining of the esophagus to turn into glandular tissue. People with Barrett's esophagus are more likely to develop adenocarcinoma of the esophagus, but the risk of developing esophageal cancer is still fairly low. Diet/nutrition. A diet that is low in fruits and vegetables and certain vitamins and minerals can increase a person's risk of developing esophageal cancer. Obesity. Being severely overweight and having too much body fat can increase a person's risk of developing esophageal adenocarcinoma. Lye. Children who have accidently swallowed lye have an increased risk of squamous cell carcinoma. Lye can be found in some cleaning products, such as drain cleaners. Achalasia. Achalasia is a condition when the lower muscular ring of the esophagus does not relax during swallowing of food. Achalasia increases the risk of squamous cell carcinoma. Human papillomavirus (HPV). Researchers are investigating HPV as a risk factor for esophageal cancer, but there is no clear link that squamous cell esophageal cancer is related to HPV infection. Sexual activity with someone who has HPV is the most common way someone gets HPV. There are different types of HPV, called strains. Research links some HPV strains more strongly with certain types of cancers. There are vaccines available to protect you from some HPV strains. Regular screening tests to find esophageal cancer in people without symptoms are not used in the United States. People with Barrett's esophagus (see Risk Factors) may be advised to have regular endoscopic examinations. An endoscopic examination is a procedure that uses a flexible, lighted tube to look inside the esophagus. During these examinations, biopsies can be taken to remove a small amount of tissue for examination under a microscope. This type of screening can help find cancer early or find changes that could become cancerous over time. Learn more about these tests in the Diagnosis section. The next section in this guide is Symptoms and Signs. It explains what body changes or medical problems esophageal cancer can cause. Use the menu to choose a different section to read in this guide. People with esophageal cancer may experience the following symptoms or signs. Sometimes, people with esophageal cancer do not have any of these changes. Or, the cause of a symptom may be a different medical condition that is not cancer. Difficulty and pain with swallowing, particularly when eating meat, bread, or raw vegetables. As the tumor grows, it can block the pathway to the stomach. Even liquid may be painful to swallow. If you are concerned about any changes you experience, please talk with your health care team. Your doctor will ask how long and how often you’ve been experiencing the symptom(s), in addition to other questions. This is to help figure out the cause of the problem, called a diagnosis. If cancer is diagnosed, relieving symptoms remains an important part of cancer care and treatment. This may be called palliative care or supportive care. Be sure to talk with your health care team about the symptoms you experience, including any new symptoms or a change in symptoms. ON THIS PAGE: You will learn about how doctors describe a cancer’s growth or spread. This is called the stage. In addition to stage, a cancer’s growth may also be described by its grade, which describes how much cancer cells look like healthy cells. To see other pages, use the menu. Staging is a way of describing where the cancer is located, if or where it has spread, and whether it is affecting other parts of the body. Doctors use diagnostic tests to find out the cancer's stage, so staging may not be complete until all the tests are finished. Knowing the stage helps the doctor to decide what kind of treatment is best and can help predict a patient's prognosis, which is the chance of recovery. There are different stage descriptions for different types of cancer. Tumor (T): How deeply has the primary tumor grown into the wall of the esophagus and the surrounding tissue? Doctors assign the stage of the cancer by combining the T, N, and M classifications. There are separate staging systems for the 2 most common types of esophageal cancer: squamous cell carcinoma and adenocarcinoma. The staging system for each is described below. For squamous cell carcinoma, the stages may be divided based on whether the tumor is in the upper, middle, or lower part of the esophagus, as well as the grade (G) of the tumor cells. Stage 0: The cancer is found in only the top lining of the esophagus. Stage IA: The cancer is in only the top layers of the esophagus. The cancer is in the top layers of the esophagus, but the tumor cells are less differentiated. The tumor is in the third layer of the esophagus, but it has not spread to the lymph nodes or other parts of the body. The tumor is in the third layer of the esophagus. Cancer cells have spread into but not through the muscle wall of the esophagus. The tumor is in the outer layer of the upper or middle part of the esophagus. The tumor is in the outer layer of the lower part of the esophagus. The tumor is in the outer layer of the upper or middle part of the esophagus. The tumor cells are less differentiated. The tumor is in the outer layer of any part of the esophagus. The tumor is in any part of the esophagus, and cancer cells have spread into the lining of the esophagus and underneath layers. Cancer has also spread to 1 or 2 lymph nodes near the tumor. The tumor is in any part of the esophagus, and cancer cells have spread into the lining of the esophagus and underneath layers. Cancer cells have also spread to 3 to 6 lymph nodes near the tumor. The tumor is in any in any part of the esophagus and has grown into the third layer of the esophagus. Cancer cells have spread to 1 or 2 lymph nodes. Cancer has spread beyond the esophagus to nearby tissue but not to lymph nodes or other areas of the body. The tumor is in any part of the esophagus and has grown into the third layer of the esophagus. It has also spread to 3 to 6 lymph nodes. The tumor is in any part of the esophagus, has grown into the outer layer of the esophagus and to either 1 to 2 or 3 to 6 lymph nodes. The tumor is in any part of the esophagus and has spread to structures surrounding the esophagus. It has either spread to no lymph nodes or only 1 to 2 lymph nodes. The tumor is in any part of the esophagus and has spread to nearby structures. It may also have spread to up to 3 to 6 lymph nodes. The cancer has spread to 7 or more regional lymph nodes. Stage IVB: The cancer has spread to other parts of the body. For adenocarcinoma, doctors use the T, N, and M classifications, as well as the grade (G). Stage IA: Cancer cells have spread into the lining of the esophagus and the layers underneath. The cancer has spread to the layers underneath the lining of the esophagus. The tumor cells are moderately differentiated. The cancer has grown into a layer of the esophagus called the submucosa. The cancer has grown into the layers underneath the lining of the esophagus or the submucosa. The cancer cells are poorly differentiated. The cancer has grown into the third layer of the esophagus. The cancer cells are well or moderately differentiated. Stage IIA: Cancer is in the third layer of the esophagus. The grade cannot be evaluated or the cells are poorly differentiated. Cancer is in the outer layer of the esophagus. Cancer is in an inner layer of the esophagus and has spread to 1 or 2 lymph nodes. Cancer is in the inner layers of the esophagus and has spread to 3 to 6 lymph nodes near the tumor. Cancer is in the third layer of the esophagus and has spread to 1 or 2 lymph nodes. Cancer is in the third layer of the esophagus and in 3 to 6 lymph nodes. Cancer is in the outer layer of the esophagus and has spread to 1 to 2 or 3 to 6 lymph nodes. The tumor has spread to structures near the esophagus and either no lymph nodes or 1 to 2 lymph nodes. The tumor has spread to structures near the esophagus and either no lymph nodes or up to 3 to 6 lymph nodes. The tumor has spread to 7 or more lymph nodes. Stage IVB: Cancer has spread to another part of the body. Recurrent: Recurrent cancer is cancer that has come back after treatment. It may come back in the esophagus or in another part of the body. If the cancer does return, there will be another round of tests to learn about the extent of the recurrence. These tests and scans are often similar to those done at the time of the original diagnosis. Used with permission of the American College of Surgeons, Chicago, Illinois. The original and primary source for this information is the AJCC Cancer Staging Manual, Eighth Edition (2017) published by Springer International Publishing. ON THIS PAGE: You will learn about the different types of treatments doctors use for people with esophageal cancer. Use the menu to see other pages. This section explains the types of treatments that are the standard of care for esophageal cancer. “Standard of care” means the best treatments known. When making treatment plan decisions, you are encouraged to consider clinical trials as an option. A clinical trial is a research study that tests a new approach to treatment. Doctors want to learn whether the new treatment is safe, effective, and possibly better than the standard treatment. Clinical trials can test a new drug, a new combination of standard treatments, or new doses of standard drugs or other treatments. Clinical trials are an option to consider for treatment and care for all stages of cancer. Your doctor can help you consider all your treatment options. To learn more about clinical trials, see the About Clinical Trials and Latest Research sections. In cancer care, different types of doctors often work together to create a patient’s overall treatment plan that combines different types of treatments. This is called a multidisciplinary team. Cancer care teams include a variety of other health care professionals, such as physician assistants, nurse practitioners, oncology nurses, social workers, pharmacists, counselors, dietitians, and others. Descriptions of the common types of treatments used for esophageal cancer are listed below. Your care plan may also include treatment for symptoms and side effects, an important part of cancer care. For people with a tumor that has not spread beyond the esophagus and lymph nodes, doctors often recommend combining different types of treatment: radiation therapy, chemotherapy, and surgery. The order of treatments varies, and several factors are considered, including the type of esophageal cancer. Particularly for squamous cell cancer, chemotherapy and radiation therapy, a combination called chemoradiotherapy, are commonly recommended as the first treatment. Surgery may be used afterwards depending how well chemoradiotherapy worked. Recent studies show using chemoradiotherapy before surgery is better than surgery alone. For adenocarcinoma, the most common treatment in the United States is chemotherapy and radiation therapy followed by surgery. Surgery is almost always recommended after chemoradiotherapy, unless there are factors that increase the risks from surgery, such as a patient’s age or overall health. For advanced esophageal cancer, treatment usually involves chemotherapy and radiation therapy. Cancer and its treatment often cause side effects. In addition to treatment intended to slow, stop, or eliminate the cancer, an important part of cancer care is relieving a person’s symptoms and side effects. This approach is called palliative or supportive care, and it includes supporting the patient with his or her physical, emotional, and social needs. Surgery is the removal of the tumor and some surrounding healthy tissue during an operation. A surgical oncologist is a doctor who specializes in treating cancer using surgery. Surgery has traditionally been the most common treatment for esophageal cancer. However, currently, surgery is used as the main treatment only for patients with early-stage esophageal cancer. For patients with locally-advanced esophageal cancer, a combination of chemotherapy and radiation therapy (see below) may be used before surgery to shrink the tumor. For people who cannot have surgery, the best treatment option is often a combination of chemotherapy and radiation therapy. The most common surgery to treat esophageal cancer is called an esophagectomy, where the doctor removes the affected part of the esophagus and then connects the remaining healthy part of the esophagus to the stomach so that the patient can swallow normally. The stomach or part of the intestine may sometimes be used to make the connection. The surgeon also removes lymph nodes around the esophagus. Put in a percutaneous gastrostomy or jejunostomy, also called a feeding tube, so that a person can receive nutrition directly into the stomach or intestine. This may be done before chemotherapy and radiation therapy is given to make sure that the person can eat enough food to maintain his or her weight and strength during treatment. Create a bypass, or new pathway, to the stomach if a tumor blocks the esophagus but cannot be removed with surgery; this procedure is rarely used. People who have had trouble eating and drinking may need intravenous (IV; into a vein) feedings and fluids for several days before and after surgery, as well as antibiotics to prevent or treat infections. Patients learn special coughing and breathing exercises to keep their lungs clear. The following treatments use an endoscope (see Diagnosis) to treat esophageal cancer and to manage side effects caused by the tumor. Endoscopy and dilation. This procedure expands the esophagus. It may have to be repeated if the tumor grows. Endoscopy with stent placement. This procedure uses an endoscopy to insert a stent in the esophagus. An esophageal stent is a metal, mesh device that is expanded to keep the esophagus open. Electrocoagulation. This type of palliative treatment helps kill cancer cells by heating them with an electric current. This is sometimes used to help relieve symptoms by removing a blockage caused by the tumor. Cryotherapy. This is a type of palliative treatment that uses an endoscope with a probe attached that can freeze and remove tumor tissue. It can be used to reduce the size of a tumor to help a patient swallow better. Radiation therapy is the use of high-energy x-rays or other particles to destroy cancer cells. A doctor who specializes in giving radiation therapy to treat cancer is called a radiation oncologist. A radiation therapy regimen, or schedule, usually consists of a specific number of treatments given over a set period of time. The most common type of radiation treatment is called external-beam radiation therapy, which is radiation therapy given from a machine outside the body. When radiation treatment is given directly inside the body, it is called internal radiation therapy or brachytherapy. For esophageal cancer, this involves temporarily inserting a radioactive wire into the esophagus using an endoscope (see Diagnosis). Proton beam therapy is being studied in clinical trials for esophageal cancer. Proton beam therapy is a type of external-beam radiation therapy that uses protons rather than x-rays. At high energy, protons can destroy cancer cells. Side effects from radiation therapy may include fatigue, mild skin reactions, soreness in the throat and esophagus, difficulty or pain with swallowing, upset stomach, nausea, and loose bowel movements. Most side effects go away soon after treatment is finished. Learn more about the basics of radiation therapy. A chemotherapy regimen, or schedule, usually consists of a specific number of cycles given over a set period of time. A patient may receive 1 drug at a time or a combination of different drugs given at the same time. As explained above, chemotherapy and radiation therapy are often given at the same time to treat esophageal cancer, called chemoradiotherapy. HER2-targeted therapy. For esophageal cancer, the targeted therapy trastuzumab (Herceptin, Ogivri) may be used along with chemotherapy as a first treatment for patients with metastatic esophageal adenocarcinoma. For patients with metastatic or recurrent gastroesophageal cancer that is HER2 positive, ASCO, ASCP, and CAP recommend a combination of chemotherapy and HER2-targeted therapy. If the cancer is HER2 negative, HER2-targeted therapy is not a treatment option for you, and your doctor will give you other options for treating the cancer. Anti-angiogenesis therapy. The targeted therapy ramucirumab (Cyramza) is also an option if first-line therapy, or the first treatments given, has not worked. Ramucirumab is a type of targeted therapy called an anti-angiogenic. It is focused on stopping angiogenesis, which is the process of making new blood vessels. Because a tumor needs the nutrients delivered by blood vessels to grow and spread, the goal of anti-angiogenesis therapies is to “starve” the tumor. Ramucirumab may be given by itself or with paclitaxel (Abraxane), a type of chemotherapy (see above). Talk with your doctor about possible side effects for each specific medication you are prescribed and how they can be managed. Pembrolizumab (Keytruda) is a type of immunotherapy that targets the PD-1/PD-L1 pathway (see Diagnosis). It is approved for patients when chemotherapy no longer works and if the cancer tests positive for PD-L1. For metastatic esophageal cancer, palliative or supportive care is very important to help relieve symptoms and side effects. The goal of treatment is usually to lengthen a person’s life, while easing symptoms such as pain and problems with eating. Your treatment plan may include chemotherapy, as well as radiation therapy to help relieve pain or discomfort. For example, an esophageal stent, laser therapy, photodynamic therapy, or cryotherapy may help keep the esophagus open (see above). A remission can be temporary or permanent. This uncertainty causes many people to worry that the cancer will come back. While many remissions are permanent, it is important to talk with your doctor about the possibility of the cancer returning. Understanding your risk of recurrence and the treatment options may help you feel more prepared if the cancer does return. Learn more about coping with the fear of recurrence. If the cancer does return after the original treatment, it is called recurrent cancer. It may come back in the same place (called a local recurrence), nearby (regional recurrence), or in another place (distant recurrence). When this occurs, a new cycle of testing will begin again to learn as much as possible about the recurrence. After this testing is done, you and your doctor will talk about the treatment options. Often the treatment plan will include the treatments described above such as surgery, chemotherapy, and radiation therapy, but they may be used in a different combination or given at a different pace. Your doctor may suggest clinical trials that are studying new ways to treat this type of recurrent cancer. Whichever treatment plan you choose, palliative care will be important for relieving symptoms and side effects. People with recurrent cancer often experience emotions such as disbelief or fear. You are encouraged to talk with the health care team about these feelings and ask about support services to help you cope. Learn more about dealing with cancer recurrence. Doctors and scientists are always looking for better ways to care for people with esophageal cancer. To make scientific advances, doctors create research studies involving volunteers, called clinical trials. In fact, every drug that is now approved by the U.S. Food and Drug Administration (FDA) was tested in clinical trials. People decide to participate in clinical trials for many reasons. For some people, a clinical trial is the best treatment option available. Because standard treatments are not perfect, people are often willing to face the added uncertainty of a clinical trial in the hope of a better result. Other people volunteer for clinical trials because they know that these studies are a way to contribute to the progress in treating esophageal cancer. Even if they do not benefit directly from the clinical trial, their participation may benefit future patients with esophageal cancer. Research through clinical trials is ongoing for all types of cancer. For specific topics being studied for esophageal cancer, learn more in the Latest Research section. Cancer.Net offers a lot of information about cancer clinical trials in other areas of the website, including a complete section on clinical trials and places to search for clinical trials for a specific type of cancer. In addition, this website offers free access to a video-based educational program about cancer clinical trials, located outside of this guide. The next section in this guide is Latest Research. It explains areas of scientific research currently going on for esophageal cancer. Use the menu to choose a different section to read in this guide. ON THIS PAGE: You will read about the scientific research being done now to learn more about this type of cancer and how to treat it. Use the menu to see other pages. Doctors are working to learn more about esophageal cancer, ways to prevent it, how to best treat it, and how to provide the best care to people diagnosed with this disease. The following areas of research may include new options for patients through clinical trials. Always talk with your doctor about the best diagnostic and treatment options for you. Chemoprevention. Researchers are looking at using aspirin and acid-reducing medication to prevent esophageal adenocarcinoma in people with Barrett’s esophagus. Research is still ongoing, and people are encouraged to talk with their doctor before taking any medications or dietary supplements for this reason. Learn about the basics of chemoprevention. PET scan. In addition to help find out the cancer’s stage (see Stages), PET scans may be used to find out how well treatment is working to shrink a tumor before surgery. Researchers are studying the use of PET scan to evaluate and possibly change treatment before surgery. Chemotherapy advances. Doctors are studying combinations of different drugs, such as capecitabine (Xeloda), cisplatin (available as a generic), docetaxel (Docefrez, Taxotere), fluorouracil (5-FU, Efudex), irinotecan (Camptosar), oxaliplatin (Eloxatin) and paclitaxel. Research is ongoing to find new drugs that are effective for esophageal cancer. Targeted therapy. Several types of targeted therapies are currently being studied for esophageal cancer. In addition to trastuzumab, researchers are looking at newer drugs that target HER2 for advanced esophageal adenocarcinoma, as well as combining trastuzumab with radiation therapy. Researchers are looking at new drugs that block vascular endothelial growth factor (VEGF). Immunotherapy. New drugs and combinations that include immunotherapy are continuing to be studied. Palliative care. Clinical trials are underway to find better ways of reducing symptoms and side effects of current esophageal cancer treatments to improve patients’ comfort and quality of life. As you prepare to start cancer treatment, it is normal to fear treatment-related side effects. It may help to know that your health care team will work to prevent and relieve side effects. Doctors call this part of cancer treatment “palliative care” or “supportive care.” It is an important part of your treatment plan, regardless of your age or the stage of disease. Common physical side effects from each treatment option for esophageal cancer are listed in the Types of Treatment section. Learn more about side effects of cancer and its treatment, along with ways to prevent or control them. Changes to your physical health depend on several factors, including the cancer’s stage, the length and dose of treatment, and your general health. Sometimes, physical side effects can last after treatment ends. Doctors call these long-term side effects. They call side effects that occur months or years after treatment late effects. Treating long-term side effects and late effects is an important part of survivorship care. Learn more by reading the Follow-up Care section of this guide or talking with your doctor. You can have emotional and social effects as well as physical effects after a cancer diagnosis. This may include dealing with difficult emotions, such as sadness, anxiety, or anger, or managing your stress level. Sometimes, patients have problems expressing how they feel to their loved ones, or people do not know what to say in response. Patients and their families are encouraged to share their feelings with a member of their health care team. You can also find coping strategies for emotional and social effects in a separate section of this website. This section includes many resources for finding support and information to meet your needs. Family members and friends often play an important role in taking care of a person with esophageal cancer. This is called being a caregiver. Caregivers can provide physical, practical, and emotional support to the patient, even if they live far away. Care for people diagnosed with cancer does not end when active treatment has finished. Your health care team will continue to check to make sure the cancer has not returned, manage any side effects, and monitor your overall health. This is called follow-up care. Your follow-up care may include regular physical examinations, medical tests, or both. Doctors want to keep track of your recovery in the months and years ahead. One goal of follow-up care is to check for a recurrence. Cancer recurs because small areas of cancer cells may remain undetected in the body. Over time, these cells may increase in number until they show up on test results or cause signs or symptoms. During follow-up care, a doctor familiar with your medical history can give you personalized information about your risk of recurrence. Your doctor will ask specific questions about your health. Some people may have blood tests or imaging tests done as part of regular follow-up care, but testing recommendations depend on several factors, including the type and stage of cancer originally diagnosed and the types of treatment given. If the esophageal cancer is in remission, follow-up care may include CT scans and upper endoscopies (see Diagnosis) to watch for a possible recurrence. Talk with your doctor about your risk of developing such side effects based on the type of cancer, your individual treatment plan, and your overall health. If you had a treatment known to cause specific late effects, you may have certain physical examinations, scans, or blood tests to help find and manage them. For example, people who have had an esophagectomy should sleep with the head of the bed elevated to avoid acid reflux, since the stomach has been surgically moved up into the chest. This is also a good time to decide who will lead your follow-up care. Some survivors continue to see their oncologist, while others transition back to the care of their family doctor or another health care professional. This decision depends on several factors, including the type and stage of cancer, side effects, health insurance rules, and your personal preferences. If a doctor who was not directly involved in your cancer care will lead your follow-up care, be sure to share your cancer treatment summary and survivorship care plan forms with him or her and with all future health care providers. Details about your cancer treatment are very valuable to the health care professionals who will care for you throughout your lifetime. Survivorship is one of the most complicated parts of having cancer. This is because it is different for everyone. Survivors may experience a mixture of strong feelings, including joy, concern, relief, guilt, and fear. Some people say they appreciate life more after a cancer diagnosis and have gained a greater acceptance of themselves. Others become very anxious about their health and uncertain about coping with everyday life. For many people, survivorship serves as a strong motivator to make positive lifestyle changes. People recovering from esophageal cancer are encouraged to follow established guidelines for good health, such as not smoking, limiting alcohol, eating well, and managing stress. Regular physical activity can help rebuild your strength and energy level. Your health care team can help you create an appropriate exercise plan based upon your needs, physical abilities, and fitness level. Learn more about making healthy lifestyle choices. It is important to have recommended medical checkups and tests (see Follow-up Care) to take care of your health. Cancer rehabilitation may be recommended, and this could mean any of a wide range of services such as physical therapy, career counseling, pain management, nutritional planning, and/or emotional counseling. The goal of rehabilitation is to help people regain control over many aspects of their lives and remain as independent and productive as possible. Talk with your health care team to develop a survivorship care plan that is best for your needs. What type of esophageal cancer do I have? Is the cancer located only in my esophagus? What is the stage of the disease? What does this mean? What clinical trials are available me? Where are they located, and how do I find out more about them? Are there radiation therapy and surgery options to treat the cancer? Is surgery needed as part of treatment? How experienced is the surgeon with this type of surgery? Can chemotherapy control the cancer? What are the possible long-term effects and complications of having this surgery?